One things for certain, when you sign on with Dan DiDio the man has got your back for life. When DiDio graduated to DC's newly appointed 'Executive Justice League' back in February (alongside Geoff Johns and Jim Lee), rumours instantly started swirling as to who would step into the his old swivel chair of power as Editor-in-Chief. Today that job went to one of the writers who first went exclusive with Dan, when DiDio originally took-over running the halls of DC Comics; Judd Winick. Judd, himself a reality TV star turned comic book pro, has touched almost every corner of the DCU, with fairly lengthy and sometimes controversial runs, at the head of books like Green Lantern, Titans, The Outsiders, Green Arrow and Batman. 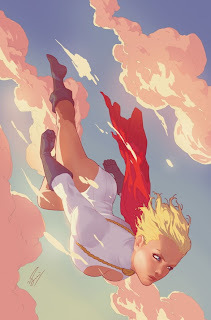 While an email press release announcing the move did not state what Winick's experience with the DC library of characters would mean for his time in the hotseat, it did promise the role would not interfere with his upcoming work on both Power Girl and Justice League: Generation Lost. While the web will no doubt explode with this story, as it did with the three previous appointments, you can catch the full press release and commemorative sketch at mainstay sci-fi website; Once Upon A Geek.